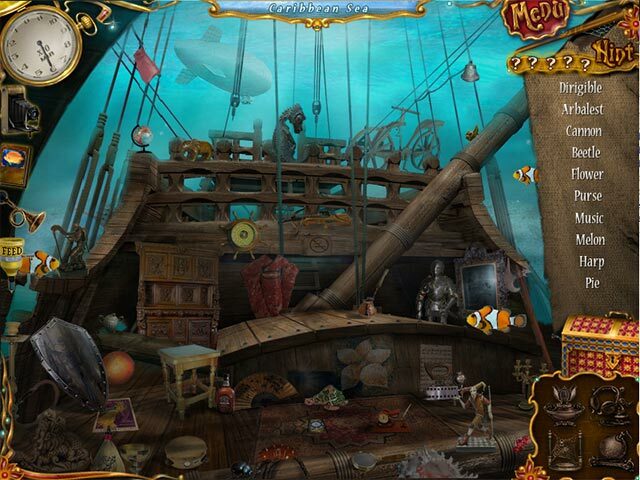 Rated 4 out of 5 by pennmom36 from 10 Days 9 Artifacts I liked this hidden object adventure. 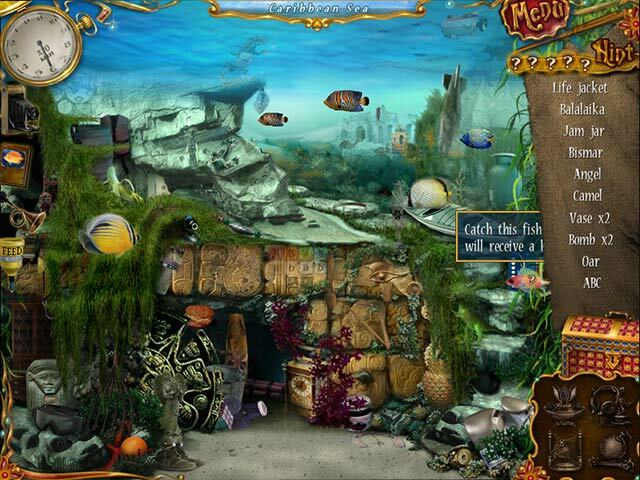 you choose one underwater location at a time and you can take photos of the fish and add them to a photo album, you can even feed the fish while you look for missing artifacts. The only complaint I have is that some items were extremely small. Rated 4 out of 5 by rugspot from Eye strain.!!!! I'm sorry used my free game. It's to bad it could, be a nice relaxing game. I have improved my sight and, still got, a headache to see ho's. I will stick to my good games and ho's. Rated 4 out of 5 by lindaye from Fishy Foto Fun This is he best photo taking game that I have played. You get what you click. I don't like the storyline, but gotta keep coming back for those fishy fotos. Rated 4 out of 5 by BellaMorte from Time Passer Been a while since I played this game but what I remember was that it was okay. I don't believe it was overly challenging but I didn't mind it. The visuals and sound quality are good however. Over all, I've played it every time I've updated my computer/s... which is probably 3 or 4 times now. Rated 3 out of 5 by cowclaudia from Not easy This is not the easiest HOS believe me - objects at times are very small, buried in something that you can barely see it and the fish swimming by obscure it. It's definitely a challenge for those who like this type of thing and not for those who want a relaxing game. Rated 3 out of 5 by arnold1049 from SHORT, SIMPLE HOG GAME The storyline is Ok, about finding treasure to return to their owner in exchange for saving the protagonist's little sister. I played the timed option but had no problem finishing the "chapters" within the time allowed. For each set of 5 locations, you are allocated 5 hints. However, there are a couple of other ways to zero in on an item. The HOS were very inconsistent, with some being fairly easy, and others being a lot harder. The size of the objects within each scene also varied greatly, from fairly large to so small and dark, that, even with several hints, it was a matter of clicking around in the area until you hit it. The purpose of taking pictures of the fish was never explained, but basically, depending on how good your pictures were, you received a trophy at the end of the game. And, as indicated in the title, it is a fairly short game in comparison to most other similar games. Rated 3 out of 5 by LinRupp from Graphics lacking The puzzles were fun but the graphics are awful. Rated 3 out of 5 by Mlp1x2 from DOESN'T LOOK LIKE BEADS TO ME..... This game could actually be one of the better "Hidden Object" games (because you actually play by finding just hidden objects) except for one factor.....some of the items listed on the FIND CHART does not match the PICTURES you have to find...for example...."cigars" looks like a "pile of wood", "earphones" looks like a "record" & etc... although most of the pictures match the words, but with only 5 hints for 6 different sections per level, you either use up all of your hints trying to find what you would think would be simple or you use up all of your bonus search items early.....This game does have the benefit of having 90% of the find list & pictures being correct & fun..but after playing for just 15 minutes, I just turned it off because it was getting frustrating trying to find "beads" that looked like a "seashell". Rated 3 out of 5 by coolang1989 from IT WAS OK Well first I have to say that this game was ok. The objects were a little had to see because all the scenes are underwater. Some of the objects were so small they were hard to find. It took me a little while to figure out the hint feature. The sound quality was good and I gave the level of challenge four stars because of the hard to see objects. 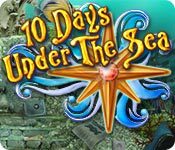 Rated 3 out of 5 by vonajm from drown before 10 days are up The graphics and music are nice but things are hard to find and my eye sight isn't the best and only 5 hints and a flash in the pan from a relic--that alone takes the fun out of the game! I prefer interactive HOS games but if you can see well, like just finding things then kyou might enjoy this little game Not for me! Rated 2 out of 5 by grapeleaves from No Thank You!! You say objects are clear look again. The fish distract you trying to find the objects. Don't waste your time and money. Two stars enough people. Then they will stop these games. Rated 2 out of 5 by AverageSizeFish from Has not stood the test of time - graphics are awful This is an older HOP game with graphics that are so grainy game play is significantly affected. The game also has significant lag. The HOS are challenging but much of the challenge is due to the very low quality of the graphics. The puzzles are severely affected by lag. Game play consists entirely of HOS and puzzles so these problems affect the entire game. There is nothing here that works properly anymore. This is, unfortunately, another example of a game that has been rendered virtually unplayable by the passage of time. Rated 2 out of 5 by bossychick from I thought it was boring. 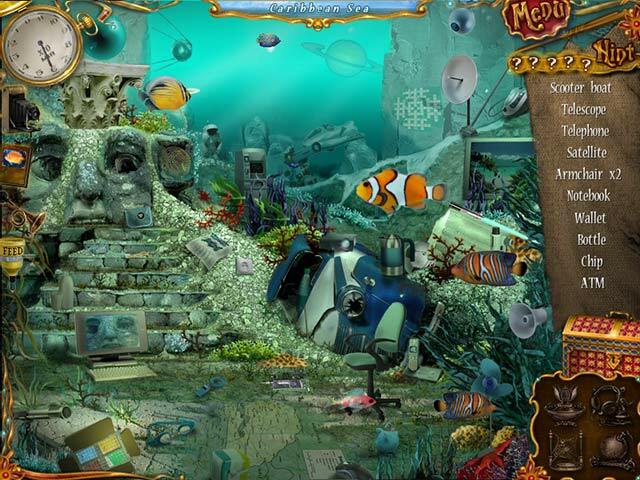 You are under water the whole time just searching for hidden objects, that's it. Oh, and fish are swimming around and you take pictures of them to add them to your fish photo collection. I am very picky about hidden object games and this one just wasn't doing it for me. Rated 1 out of 5 by Garycm from Can't find anything Stupid game. objects are so obscure and badly drawn I can't find things. I just poked around until something registered and was shocked to see that was an object I was suppose to see. Even with a magnifying glass I couldn't find stuff. I erased the game after the first hour playing.